Over the past couple of years it has been a trend to take an everyday item, slap the word smart in front of it, and make it do truly amazing things. There has been a huge explosion in wearable tech recently, devices including smart watches, smart glasses, smart bands, and even smart bras have started to expose themselves to the consumer market. Google has taken the term "wearable tech" to a whole new level with their newest innovation. When Google first showed off Google Glass they really showed us that the sky is the limit when it comes to how we interact with technology. Personally I was amazed by this technology, but one of the first thoughts that came to mind is whether or not we would ever see smart contact lens. 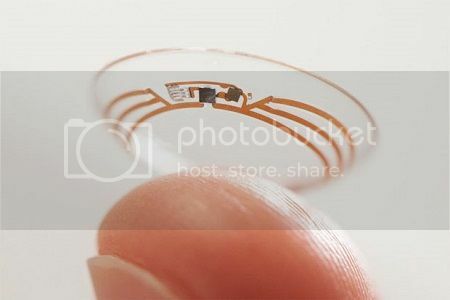 Lo and behold, Google has recently unveiled their latest and greatest technology, smart contact lens. Now before you imagine the experience of Google glass embedded in your eye with no external hardware, I have some disappointing news. Currently the contact lens don't have a screen, meaning they cannot provide the experience that Google Glass is able to. Unlike Google Glass, the contact lens currently only serve one purpose: To help people with diabetes. Most traditional ways of gathering a glucose level can be rather intrusive, but these contact lens allow your glucose levels to be taken discretely, automatically, and easily. 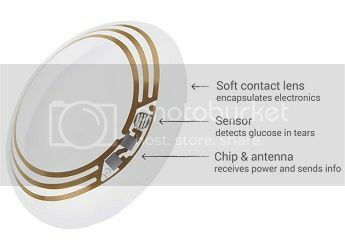 The contact lens is made up of two layers of bio compatible contact lens material with a tiny processing chip and glucose sensor in between the two layers. The sensor takes the glucose levels from your tears approximately once every second. Once the sensor detects a dangerous reading, it will send an alert to an external device. At this point it's unsaid what will be compatible, but one can assume the lens can send an alert to your phone. At this point there are still a lot of unanswered questions. Such as the estimated time of arrival and price tag, but one big question that still remains is how the device is powered. As shown in the diagram above, there doesn't appear to be a power source directly on the lens. It's quite possible that it could receive power from a separate power supply or it could be charged via a conductive charging pad. The one thing we do know is that Google has already ran tests to make sure it is comfortable and accurate, and is working with other partners and the FDA to get this technology out on the market.